This season, I headed back to Paris for Paris Fashion Week, which is fast becoming my favourite city to skip around for shows. I first attended PFW last March, I wrote about being a newbie and finding my feet in this post. It was slightly disconcerting going from knowing the ropes in London to being uncertain in Paris but I actually relished all of the unknowns – from the venue to the queue politics to the street style photographers. Now back for my second season, I came armed with the knowledge I had gained during my inaugural season. And you know what, it felt like coming home. Hopping and skipping across the city between shows and showroom appointments felt like my natural habitat and I had a much more packed schedule than the first time around. Want to see what I got up to? Read on! I was extremely honoured to attend Issey Miyake’s AW18 show. One of my favourite designers through the ’90s, his brand is always technically innovative while never compromising on its foundation in the beauty of simplicity. Perhaps best known for pleating, Miyake began to experiment with pleating in the ’80s and his new method involved cutting and sewing each piece before sandwiching it between layers of paper and being fed through a heat press to be pleated. The fabric’s “memory” held the pleats and each piece was super flexible and easy to care for. Revolutionary. This season, womenswear Creative Director Yoshiyuki Miyamae introduced gentle movement and waves to amplify the pleats, complete with a dash of colour to further accentuate the house’s signature texture. A beautifully clean all-white collection made way for yellows and blues, a bold symphony of harmonious pleats. Mashama’s AW18 collection is an ode to tender yet strong women. Inspired by Satoshi Kon’s anime film ‘Perfect Blue’, she takes the split personalities of the protagonist, Mima, and translates them into a beautifully maximalist collection of overflowing layers and oversized pieces. 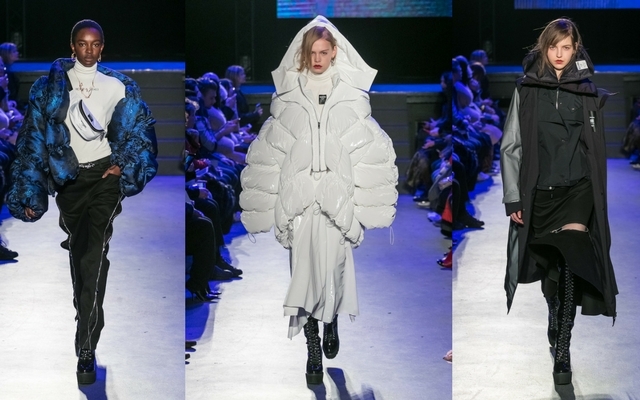 Key details include exaggerated hoods, deconstructed and voluminous silhouettes and the most delicious bubble puffer jackets. The collection also saw the introduction of denim and several technical innovations including a colour-changing coat, heat-absorbing patches and body-warming puffers. The perfect armour for the woman of today. As Creative Director of the John Galliano brand, Bill Gayyten has an unenviable task. It can’t be easy to be at the helm of a brand named after arguably one of the most brilliant designers of our time. Yet Gayyten artfully translates Galliano’s design signatures season after season. To my delight, this season saw the return of the Galliano Gazette, perhaps one of my favourite signatures of Mr Galliano. For FW18, he is inspired by the Great Depression in Midwest America and burlesque stars of the ’30s and ’40s. The resulting collection is a contrast between practical tweeds and denims and beautiful tulle concoctions adorned with diamonds and pearls. Further accentuated by the styling, sheer layers were artfully juxtaposed between boxy blazers and heavier fabrics for a look which is provocatively undone. Another utterly brilliant collection. Few designers on the PFW roster are as quintessentially Parisian as Agnes B and this is why her collection is always one of my highlights of Paris Fashion Week. This season, inspired by A Une Passante poem by Baudelaire and Marguerite Duras’ book L’Amant, her collection featured rich fabrics accentuated by jewel tones. Her laid-back silhouettes felt typically Parisian and super covetable. The bridal look which closed the show this season was a darling pretty millennial pink concoction. Set in the imposing Intercontinental Paris The Grand hotel, Valentin Yudashkin’s show was a triumph of almost couture-like beauty. Gowns and cocktail dresses in tulle adorned with sparkles and ostrich feathers trims shimmied down the runway, each more beautiful than the last. A handful of daywear looks grounded the collection but all eyes were on the gowns. A nod to the ’80s, with bold shoulder blazers, taffeta puffball dresses contrasting with slinky bodycon numbers. I can’t wait to see these looks on the red carpet. Undeniably the designer of the moment, I popped in to see Richard Quinn’s exquisite collection in all it’s resplendent detail. You may remember Quinn making headlines as HRH The Queen sat front row at his AW18 show. The Central Saint Martin grad has been making waves since he launched his eponymous label in 2016. Best known for his bold and emotive use of florals, his penchant for prints really IS groundbreaking. His AW18 collection featured languid maxi dresses, simple gowns and oversized capes and puffers in his signature prints – blown up and clashing for a real style statement. I am very, very excited about Quinn, he is the future of British fashion! As I mentioned in my last post about Paris Fashion Week, one of the most interesting aspects of Paris is heading into the showrooms to see collections up close. Although I see most of the London designers in our hometown, inevitably I will miss a show or presentation due to the packed schedule so it’s great to catch up with the likes of Eudon Choi, Edeline Lee, Ryan Lo and Marta Jakubowski. Huang is another British-based designer I caught up with during a showroom appointment in Paris. Unfortunately, I missed her presentation in London but I’m so glad I had the opportunity to see her brilliant collection. Walking the line between commercial and conceptual, Huang’s brand explores self-expression through fabrics and materials. I saw influences of abstract art in her collection, which featured her signature elongated silhouettes. The accessories were a real highlight. Alexandre Birman has been making beautiful shoes inspired by his rich Brazilian roots for a decade. Simple and feminine, his shoes are handcrafted in bold shades and prints making for a real style statement. For AW18, his collection featured exotic materials and both vibrant, clashing shades and rich plums and greys. If you are after unapologetic glamour, Alexandre Vauthier should be top of your list. Designing couture for the likes of Thierry Mugler and Jean Paul Gaultier before launching his eponymous label in 2009. Officially recognised by the Chambre Syndicale de la Haute Couture, his couture collections are of course sublime and echoes of this collection are evident in his RTW line. Using his key couture colour stories of rich ruby red, regal violet and deep emerald, the collection featured exquisite, luxe pieces in rich, heavy fabrics and often adorned with some sparkle. Inspired by the ’80s, his signature dress silhouette is short, cinched and of course with a statement shoulder. I’m glad to see his crystal-studded jeans make a return and also the introduction of an eyewear collaboration with Alain Mikli and diamante stiletto designed with Amina Muaddi. One of the best things about Paris is that absolutely everyone is in town. The fashion world really is tiny and I’m forever bumping into people I haven’t seen since London or Paris last season! I have a little crew who I know are going to be at PFW so we sync diaries for shows, showrooms and delicious places to eat in between but it’s slightly more fun when you bump into someone unexpectedly. This season, I was in town at the same time the new Monki store was opening so fortuitously I had the opportunity to catch up with my old pal Fiona, who I’ve not seen for years! I popped into the new store on Rue de Rivoli before heading to Le Grand Cerf for a bite to eat and some bubbles. She loved my sequin boots and t-shirt dress by Tobi. I also caught up with my pal Natasha of Girl In The Lens who moved to Paris last year! We’ve been blogger pals and friends for a few years now so it was lovely to catch up with her at Angelina, for their famed hot chocolate and une petite patisserie.